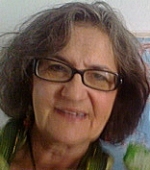 Check out Mary Ellen's website. You can also reach her via email. And check out the Peace Corp site. Zambia is a land locked country but has 40% of all water in southern Africa. Rainy season lasts 6 months of the year and the plentiful rivers, waterfalls, and streams run all year round. 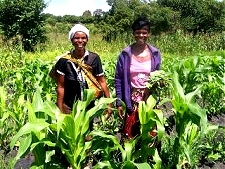 Above are Eunice and Bupe, preparing the garden for dry season planting. In the neighboring garden is Mr Kapandula doing the same with the help of his eldest son. Large families ensure help in the fields where manpower is all these small scale farmers use. Their only tools are axes and a hoe. Because these two industrious farmers plant during dry season, their gardens are located along a stream. Every two days they must bucket up water from the stream and deliver it to the garden beds which have a small ridge to hold the water inside. Eunice told me that it takes 8 buckets per bed. She starts out at 5 am daily so she can be at work by 9 am. 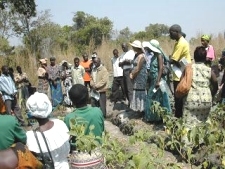 Being very good, hard-working small-scale farmers, they manage to grow maize, tomatoes, greens, onions, cassava, millet, beans, cabbages, okra, soyabeans. They fertilize and use pesticides. In the picture above, the Headwoman of Mukaka Village and her sister are working in the Chief’s garden–the duty of all faithful citizens in the chiefdom. Mrs Kapandula harvesting the greens and washing them in the trench to take to market for sale. Eunice’s daughter harvesting and taking the produce to the market. All these people pictured are HIV positive. They inspired me to write a grant to obtain irrigation pumps to carry the water from the stream to the garden beds. We submitted the grant to PEPFAR (the US President’s program to help HIV victims. On August 23rd–just 2 days before leaving the village–the pumps arrived from Lusaka and we presented them to 4 groups of people living with HIV/AIDs. That is Eunice and Bupe to my left and 80 members of the 4 groups were present. We demonstrated how to assemble the portable pumps and how to operate. They are portable and are powered by peddles, making them very appropriate technology for rural areas. You see the blue hose carrying the water from the pump to the beds while being peddled. Behind is the source of the water–a stream. Note that the peddling farmer is a woman–not unusual. Each year, Peace Corps submits a story of a successful grant. Our pump project was selected and submitted to Washington DC. Loved reading about your experiences and your success in a very challenging environment. I appreciated the fact that the pumps were a more sustainable design. I admire your commitment to service and your willingness to embrace change. Good work! Congrads….I too “volunteered” after federal employment….AWESOME!! I’m so glad you did go, and that Peace Corps has the wisdom to recognize what a tremendous lifetime of skills and experience retired Americans can bring to service. The retirees in my group were such an invaluable resource for the younger volunteers, I really can’t imagine my service without them!